Tailoring is one of the world's oldest entrepreneurial profession. Till today, tailoring business is considered to be an evergreen business. Tailors who are aiming to start a tailoring store for both men & women is a fantastic decision. Not only tailors, business people who are having their eye on fashion, style & business skills can run an online custom tailoring business store successfully. To run a successful online custom tailoring store, the owner of the store needs passion, efforts & good marketing plan. If a businessman wants to start an online custom tailoring business store & if tailors are thinking to expand their tailoring business then this article is written right for you. 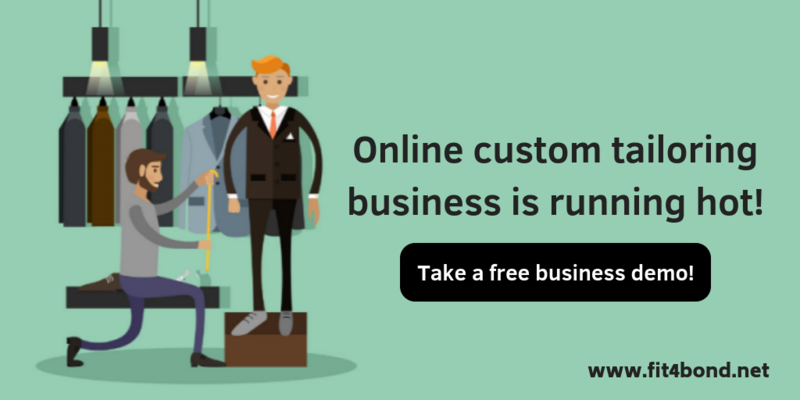 Want to start a custom tailoring business store in online? Fit4bond offers a custom tailoring software with high-end features for low investment & less risk. If tailors or business man integrates custom tailoring software in their business website, they can get many features. The features like the 3D showcase, fitting solutions,3D modeling,3D rendering, 3D prototyping,3D Design Studio..etc are necessary to run a tailoring business store successfully. Tailors can deliver their customers a customized apparels with a perfect fit. Tailors need not spend the time to visit their customers for their body measurement. With the help of body measurement module, customers can record their body measurement in the tailoring website. If customers want to customize their apparels they can use 3D design studio for designing their apparels. Tailors & businessman can reduce their paperwork by integrating custom tailoring software in their business website. The owner of the store can list n-number of fabric patterns, style of collar, cuffs, buttons etc. The owner of the tailoring store can also list various model apparels for the customers to get an idea about the upcoming fashion trend. If the owner of the store wants to integrate these features without the help of technologies like software, then the store owner should spend more money by assisting a staff. custom tailoring software reduces the work of tailors & business man. Even we can track the orders of our customers. Our custom tailoring software provides access for backend solutions. With backend solutions, the owner of the store can customize the online tailoring business website according to their own requirements. Custom tailoring software also provides e-commerce solutions for online tailoring store. store will be more flexible for the end user when e-commerce features bind with it. These are the features of fit4bond’s custom tailoring software.Fit4bond also provides tailoring business software for WordPress & Magento platform in the form of Wordpress plugins & Magento extensions. Fit4bond wishes you good luck in advance. custom tailoring platform, custom tailoring software,custom tailoring script,online custom tailoring business store,bespoke tailoring software,bespoke tailoring platform,bespoke tailoring script,online tailoring software,Suit design software,Dress shirt design software, Woocommerce tailored shirt online free download ,online tailoring platform,custom clothing store script,custom tailoring store script,startup business ideas for clothing & tailoring business store.